Probiotics are helpful bacterial “bugs” that live and work in your intestines helping to maintain your health, according to the Dairy Council of California. Often, the level of helpful bacteria is reduced in the gut due to taking antibiotics, which wipe them out, or if you are under great stress or or have a virus that wreaks havoc with the bowel. The result is digestive upset that takes the form of diarrhea and other bowel disturbances, like irritable bowel syndrome. Replacing helpful bacteria is easy when you consume foods high in probiotics. Adding probiotics to the diet daily can help reduce and relieve a variety of bowel problems, as well as reduce the effects of lactose intolerance for those who are unable to digest the enzyme lactase. 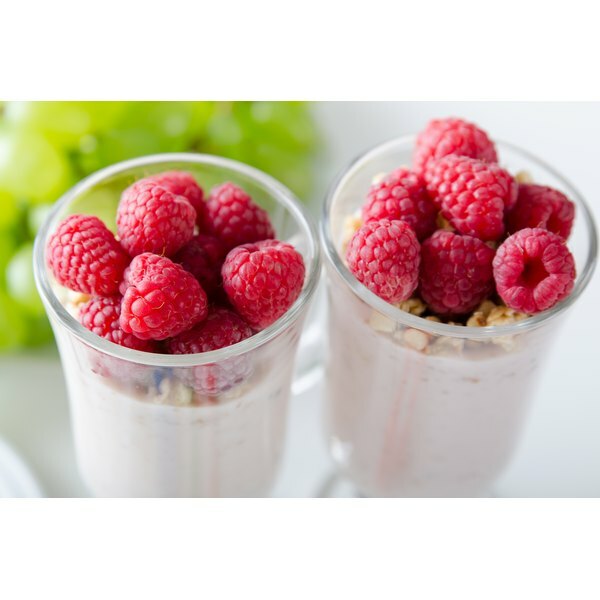 Often found in creamy, white, comfort foods, probiotics are a great option to add to your diet. One of the best sources of probiotics is yogurt. The pudding-like product has probiotics culture added to it , but not all yogurts are created equal. Those that have the seal saying they contain “live, active cultures” are the ones to look for. Kefir and Acidophilus milks are cultured and have probiotics bacteria added to them. These milks taste somewhat similar to yogurt, having a tangy bite, and are available for purchase in most health food stores. Fermented cabbage, also known as sauerkraut, is a good source of probiotics, according to the Medical University of South Carolina. The cultures are added and become active in the fermentation process. Choose sauerkraut if yogurt or cultured milks are not to your liking. Probiotic bacteria can be found in various supplements containing acidophilus and bifido bacterium. These are excellent choices for replacing the friendly bacteria in the bowel and are available for purchase at health food stores. Eating a little bit of fermented products high in probiotics is advisable if you are able to tolerate them without digestive upset. Some fermented foods are fermented fish, and miso and tempeh, which are made from fermented soy. Buy these soy products from a health food store and not an Asian market. The miso at health food stores is usually naturally aged containing the actual cultures needed.